This is the last of the vacuum tubes. It is a GE tube, but unfortunately, the model number is unreadable. I notice here some white coating on the filament that does indeed appear to be ceramic insulation. In this type, the filament is not the cathode but rather heats a separate cathode consisting of a sheet metal cylinder surrounding the filament which then emits electrons. Indirectly heated cathodes are used in most low power vacuum tubes. For example, in most vacuum tubes the cathode is a nickel tube heated by a tungsten filament inside it, and the heat from the filament causes the outside surface of the tube to emit electrons. 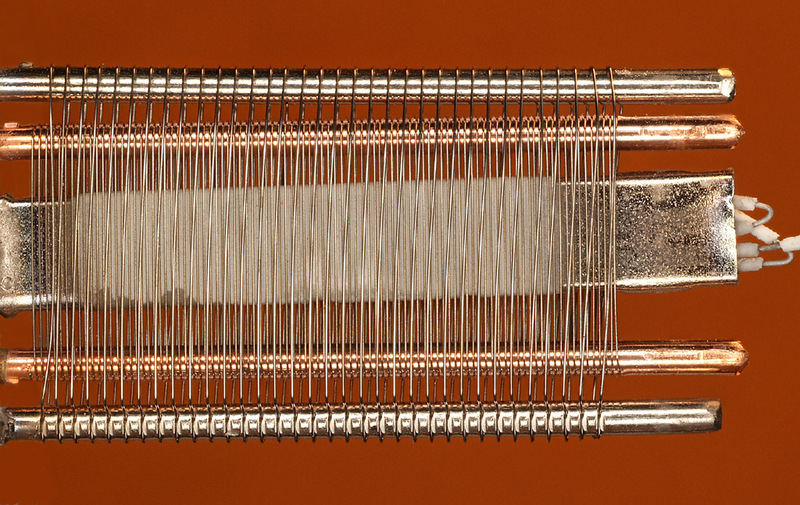 The filament of an indirectly heated cathode is usually called the heater. The main reason for using an indirectly heated cathode is to isolate the rest of the vacuum tube from the electric potential across the filament, allowing vacuum tubes to use alternating current to heat the filament. In a tube in which the filament itself was the cathode, the alternating electric field from the filament surface would affect the movement of the electrons and introduce hum into the tube output. It also allows the filaments in all the tubes in an electronic device to be tied together and supplied from the same current source, even though the cathodes they heat may be at different potentials. This tube clearly has an indirectly heated cathode, so the purpose of this white stuff is to prevent shorts of the filament (heater) to the cathode. But now I wonder... In an earlier post you wrote about white stuff to prevent "shorts to the grids" (emphasis added). Is the architecture shown here perhaps the same as what you were talking about then? If so, then I apologize for not correctly imagining what you were talking about. By the way, I notice in this picture that there appears to be a second area of light gray coating, on the cathode, covering most of the central area behind the grids. My guess is that this is the sort of coating discussed in my earlier post, whose job was to increase electron emission due to electrical properties of the surface. The coating that I had referred to earlier was a heavy white coating on filaments inside grids similar to the filament in the Cunningham vacuum tube which was not coated. In other words, the vee shaped filaments were inside the grids and were coated with whatever this material is (ceramic or thorium?). I can't say. I'm not reverse engineering these things, I'm only interested in them pictorially. However, some I know put forward the question of how these vacuum tubes were able to survive in bombers in World War II, especially since the overall vibration of the aircraft (let alone flak) would have caused the filaments to vibrate.